To ensure your pool water is safe for your swimmers and equipment, it’s imperative to properly maintain your water chemistry. If you’re not a science whiz, doing so may seem overwhelming, but don’t worry – we’re here to help. Our trained professionals can maintain your water for you through our support services. Or, if you have the time and desire to maintain your water chemistry on your own, we’ve gathered some information and tips to help. And remember, we’re always just a visit or phone call away! Water chemistry is complex, but we’ve highlighted a few basics here to help guide you. The most important thing you can do to keep your pool balanced is to test your water on a regular basis. This will alert you to challenges before they become very difficult, time-consuming and costly to correct. We recommend that you test your pool two to three times a week, and have it professionally tested every two weeks. Home tests are a great way to check for adequate sanitizer levels as well as pH and total alkalinity, but our professional testing system can test for a variety of other important things as well. For the clearest and most comfortable water, your pool water should be balanced to the levels in the chart included here. The pH of your pool is critical, and should be monitored on a regular basis to ensure you stay within the acceptable range of 7.2 – 7.6. If your pH becomes acidic, your pool equipment and surface may start to corrode – proper pH helps protect your heater, pump and other system components. If your pH drifts to the base side, you may experience scaling, deposits and cloudy water – and, this leads to less effective chlorine, meaning you have to add more chlorine. If you have a vinyl liner pool, low pH can cause the liner to expand, which will result in unsightly wrinkles, an increased risk of leaks and a shortened lifespan. A high pH will cause your liner to crack and age faster, also resulting in the need for a replacement sooner. Your swimmers will also thank you for keeping your pH properly balanced. Unbalanced pH will also cause your swimmers discomfort, such as red, burning eyes and itchy skin. Chlorine is the most widely used pool water sanitizer because it’s effective at killing bacteria and contaminants, and is also relatively inexpensive to use. When testing your water, it’s important to know the difference between free, combined and total chlorine. Combined chlorine refers to the chlorine molecule that has combined with a bacteria or microorganism, which will be removed by shocking your pool. The free chlorine refers to what is left in your pool water, and the total chlorine is the sum of both. 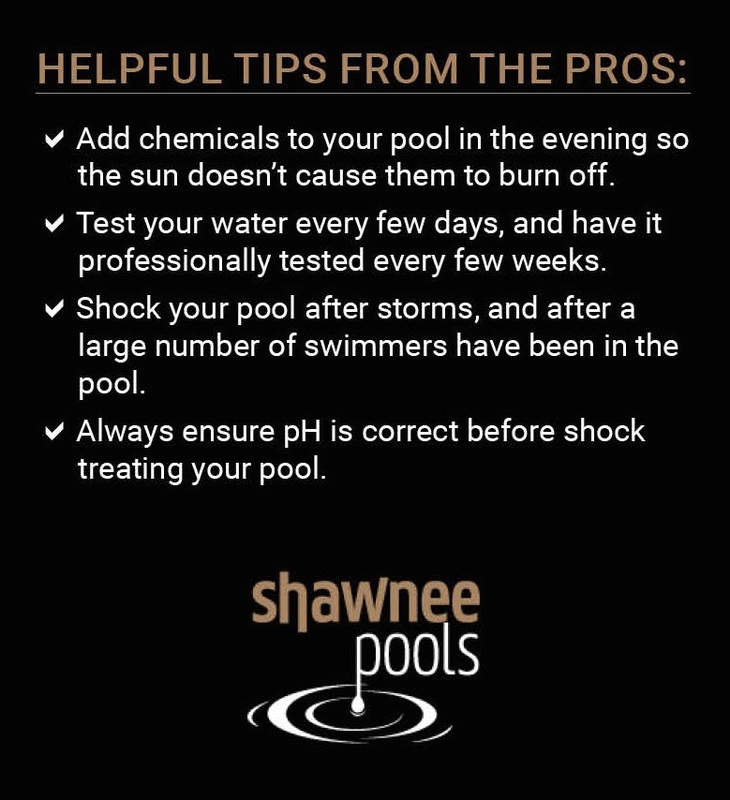 It’s also important to note that adding chlorine to your pool at the proper time is imperative to get the most out of the product. Studies have shown that you’ll lose about half of your free chlorine within 17 minutes of sun exposure – be sure to add chlorine after the sun has gone down. When you chlorinate your pool on a regular basis, the chlorine combines with the bacteria and organisms to neutralize them, and this forms what is called combined chlorine. This combined chlorine then must be removed from the pool, which is why you must shock your swimming pool. This process of super chlorination, or shocking, briefly raises the chlorine level to “burn up” all of the combined chlorine. Once you shock your pool, swimmers should stay out of the water for 8-10 hours until all of the combined chlorine is burnt up. We recommend using poolife® TurboShock® once a week, and after storms or when a large number of swimmers have been in the pool, such as a pool party. With a minimum of 75 percent available chlorine, this product is much stronger than what’s available at the big-box retail stores – and is the same price! TurboShock is a powerful treatment to combat algae and bacteria, and is a great value. Stabilizers, or cyanuric acid, can be used to help stabilize chlorine, which ensures the sanitizer lasts longer and your water stays clean for a longer period of time. These products can be purchased in liquid or granule form, or can come already mixed with your chlorine (trichlor) or shock (dichlor). They can drastically reduce the amount of chlorine you need to add to your pool – they preserve your chlorine up to five times longer than without the stabilizer. Adding the stabilizer can save you time, and quite a bit of money! There is a science to using stabilizers, so it’s important to follow directions and test your water regularly. Adding too much stabilizer can actually cause the chlorine to be become ineffective, which can lead to algae growth and cloudy water. Our experts can walk you through proper ways to use stabilizers – just stop in or call! It’s likely you have experienced – or soon will experience – algae blooms in your pool. These can be caused by out-of-balance water chemistry and improper circulation, but algae can also make its way into carefully and properly maintained pools since particles can be carried in by the wind or swimmers. If left untreated, algae can quickly take over your pool, clogging your filter and becoming more and more difficult to clear. The key to controlling algae is to start an effective treatment with premium products as soon as you see signs of algae. Phosphates, found in nearly every water source, can present water chemistry challenges in your swimming pool, as they are a food source for algae. These specialty chemicals can be used to remove phosphates from pool water, and thus remove a primary food source for algae. Every situation is different, but we often recommend using an algaecide, in conjunction with a phosphate remover, to best prevent algae blooms in your pool. If your pool water becomes cloudy, you may need to add a clarifier to bring your water back to a safe, crystal clear balance. It’s important to remember that cloudy water can be dangerous, as it’s often home to bacteria and viruses – so it’s important not to ignore cloudy water. Clarifiers work by causing fine debris and particles to coagulate into larger particles, which are removed by the pool’s filtration system. Unlike traditional chlorine pools, saltwater pools do not require the addition of chlorine on an ongoing basis to maintain safe, sparkling pool water. Instead, a saltwater purification system essentially makes chlorine in the pool water through a regenerative process. So how does this work? The pool water is converted to a mild saline solution (just 1/10th to 1/12th the saltiness of the ocean) with standard sodium chloride – the same as table salt. As this saltwater passes through the chlorine generator in the pool’s filtration system, it becomes chlorinated through electrolysis (in short, a metal cell that is charged with an electrical current). The chloride portion of the salt (the chloride in sodium chloride) now becomes the sanitizer in your water and will kill bacteria, algae, viruses and other radicals that could otherwise make your water unsafe, cloudy or discolored. The best part is that this process is reversible, meaning that the process does not actually consume the salt, but rather, that salt is used over and over again to maintain safe, sparkling water. The day-to-day maintenance is much less due to not having to test and add chlorine, but there is some maintenance required to keep the cell in the generator clean, and to extend the life of the cell. If you don’t maintain the cell, it will calcify and corrode, and will produce little chlorine. Also important for the life of your cell is maintaining the pH level. The pH level tends to drift up in saltwater pools, which can cause calcium scaling on your pool’s surface and can shorten the lifespan of the cell itself.